There are hundreds of bouyancy aids on the market yet not one is truely aimed at the racing paddler. Tripper is squarely aiming at the racing market with this item. It is both lightweight and very flexible leaving the paddler to get on unhindered. For any racing paddler a bouyancy aid is neccessary at some events, whether you are under 14 or in the lower divisions or you race on the ocean, down the DW or any other of the events where bouyancy is compulsory you will have to choose the lesser of all the evils out there. Having raced several ocean ski races in this I have to say it is the best one yet. Plenty of room for your arms and the front portion is very short so does not sit on your lap when you sit down. It feels like a majority of the bouyancy is on your back which is more comfortable when paddling and keeps you slightly cooler than having it on the front. This may possibly have the downside of floating you face down should the worst happen! but to be fair we dont really wear these for any other reason than to be allowed to race. Adjustment of the bouyancy aid is simple with 3 straps which you tighten or loosen to suit your size then it is as simple as a zip up the front. The first time you set it up is a little fiddly but once set, it couldnt be easier, there is no struggling in and out of this one which is so common on some other brands. A really nice feature is that on the back of the vest is a pocket which fits the Tripper drink system (Camelback type) so there is no need for ythe bulky harness affair if you want to use that type of system. 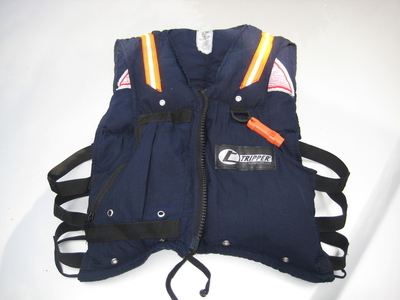 The bouyancy comes from polystyrene balls which is why the vest moulds so neatly to your body, the one downside of this on this model was they tend to congregate at the bottom of their sewn segments. However I am told in the new model the segments will be divided into smaller sections to stop this happening. Even if they do not end up making that change this is still the best bouyancy aid I have ever used. If you have to have one then get this one. We are going to stock these as we can wholeheartedly reccommend them.